In its 48-year history, the thousand-ton propeller Wisconsin was a ship fraught with disaster and strange contrasts. It was given the name Wisconsin on the day it was launched in 1881, and still had that name on the day it foundered off Kenosha in 1929. Yet the vessel went through six name changes in between. Her names included E. G. Crosby twice. The ship also was named the General Robert M. OReilly for one year, from 1918 to 1919. Its other names were Naomi and Pilgrim. The vessel burned off Grand Haven on May 21, 1907, with the loss of five lives, and it took another 16 lives when it sank on Oct. 29, 1929. Yet during World War I, as the Crosby, the ship was used on the Atlantic coast as a hospital convalescent facility at New York and may have been regarded as a lifesaver. In those days, however, the soldiers probably did not regard it as a place they wanted to be. Even though it went through numerous changes of ownership, a serious fire, and was nearly sunk when trapped in ice off Grand Haven in 1885, and was rebuilt several times, the Wisconsin ended its career as the same basic boat it was when launched. This was a passenger and freight hauler. Also the ship's first owner, the Goodrich Transit Company of Chicago, was its final owner. There were four other owners in between. It was known as the Naomi when the vessel sustained a tragic fire that claimed the lives of five people, four of them trapped below deck, in 1907. Fire broke out at about 1:30 a.m. while the Naomi, under the command of Capt. 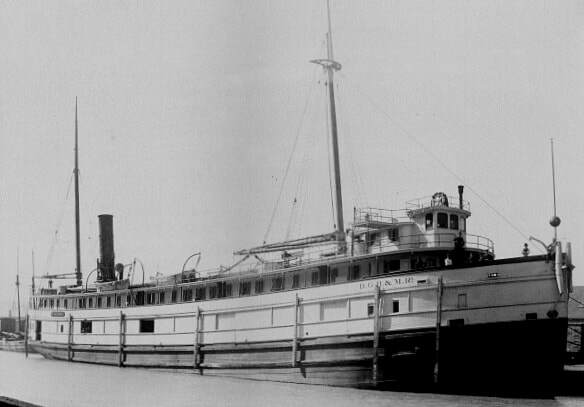 Thomas Traill, was steaming from Grand Haven to Milwaukee with 50 passengers, an estimated 30 crew members and an unknown cargo of freight. That three other boats were nearby and able to come to the vessel's aid at sea averted what might have been an even worse disaster. The steamers Saxona, Kansas and D. G. Kerr converged on the burning vessel in time to save lives. A lookout on the Kansas spotted the fire breaking out even before the crew members on the Naomi knew. The Kerr, commanded by a Captain Ballentine, drew alongside the stern of the burning boat to take passengers, while the Saxona, with Capt. George McCollough at the helm, picked up survivors from several lifeboats. But rescuers discovered, to their horror, that four coal passers were trapped alive below deck in the ship's forecastle with no way of escape. The men's faces appeared at a tiny porthole as they pleaded for help and took turns getting air. But the portholes were too small for the men to climb through. The ship's hull was steel. Even though two of the assisting boats stood by, with fire hoses turned on the Naomi's hull, they could not save the trapped sailors. Captain McCollough said of the incident: "There was no possible means of getting those men out from the red hot steel cage in which they were imprisoned. The cries of the imprisoned men ceased and we heard no more." There was a fifth death. A passenger, J. M. Rhoades, a lumber buyer from Detroit, escaped the burning boat but was so badly burned he died later in a Grand Rapids hospital. The Naomi's burned hull was towed to Manitowoc, Wisconsin, where it was rebuilt and put back into service. The second and final disaster happened when the Wisconsin developed a serious leak during a northwest gale and sank about seven miles off Kenosha. She was making her last trip from Chicago to Milwaukee with 75 passengers and crew members and a cargo of automobiles in 1929. The captain was H. Dougal Morrison. First Mate Edward Halverson said he was on the deck helping the crew secure the hatches from the storm when word came that the boat was taking on water. The cause of the leak was not discovered. The leak was so bad the crew soon knew the boat was in danger. Morrison ordered the radio operator, twenty-year-old Kenneth Carlson, to signal for help. Carlson made contact with a land station at Chicago, when then telephoned the Coast Guard stations at Racine and Kenosha. He said he continued sending S.O.S. signals until the radio went dead, then boarded a lifeboat minutes before the Wisconsin foundered at 7:10 a.m.
Coast Guard cutters and the fishing boat Chambers Brothers arrived in time to rescue 59 survivors. Of these, 19 were later hospitalized. Among the 16 lost in the sinking were Captain Morrison and Chief Engineer Julius Bushman.